center without redundant systems or components somewhere. 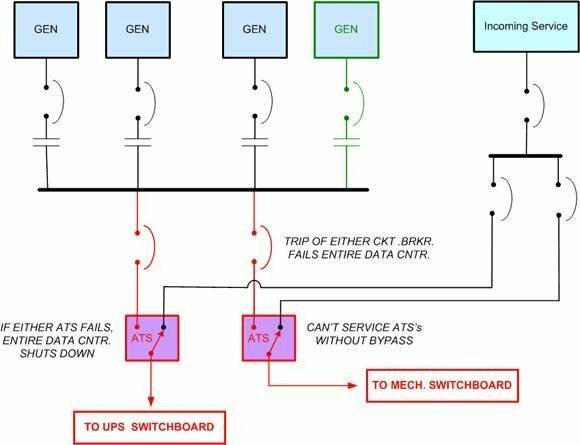 Common examples include “dual-corded” servers and network switches with multiple redundant power supplies. The data center infrastructure typically includes redundant air conditioners, uninterruptable power supply (UPS) systems, generators and even redundant utility feeds to support a reliable facility. 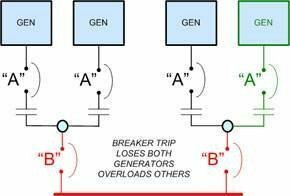 In this tip, I’ll uncover some potential single-point-of-failure flaws hidden in a data center electrical design and explain how to remedy or avoid these problems. 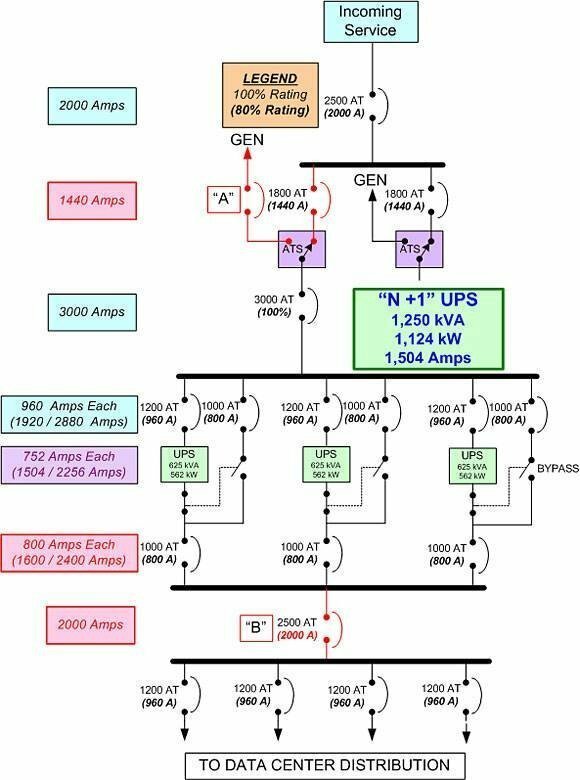 Do dual-power-supply servers increase redundancy? Illustration No. 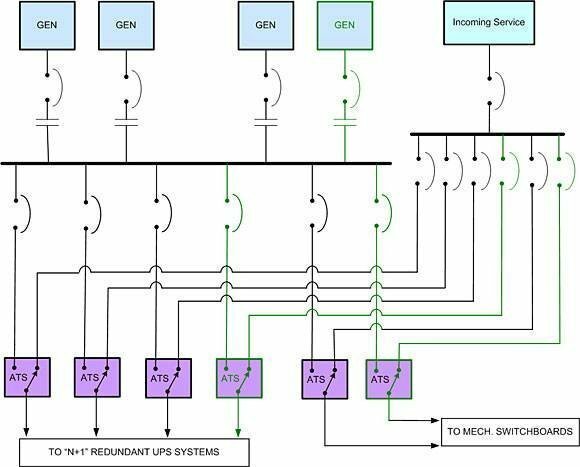 11 shows the distribution approach that is more common today in a 2N power design. 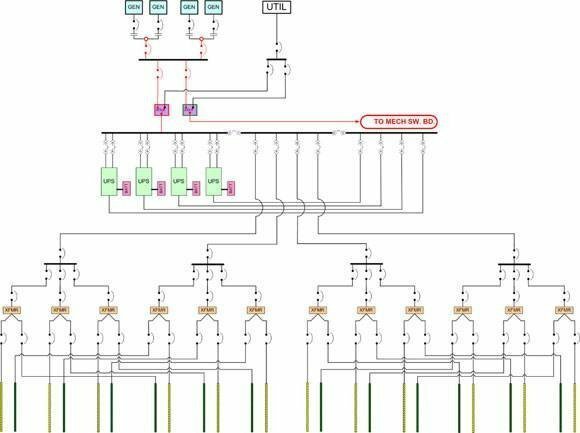 With 2N systems, there is little reason to combine the power into a single output bus since virtually all computing hardware is now dual corded and can run from either power source if the other fails. 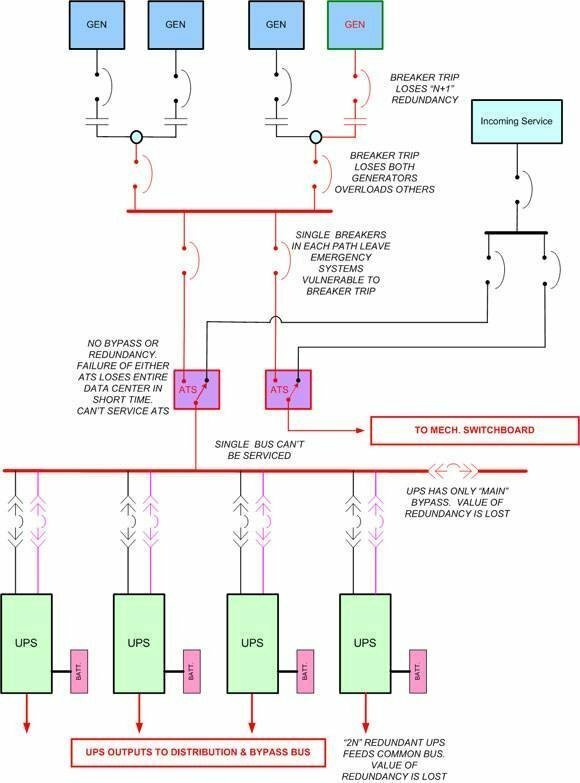 Equipment that is single corded can be protected with local, rack-mounted static transfer switches (STSes) or, if a "belt and suspenders" approach is preferred, a large STS can be installed between the UPS output feeds as is shown in this illustration as an option. (Many people regard large STSes as another potential single point of failure and no longer use them. This is a matter of preference.) Either way, the additional cost will be only a small percentage of the investment in what is intended to be total redundancy protection. About the author: Robert McFarlane is a principal in charge of data center design for the international consulting firm Shen Milsom &Wilke LLC. McFarlane has spent more than 35 years in communications consulting, has experience in every segment of the data center industry and was a pioneer in developing the field of building cable design. McFarlane also teaches the data center facilities course in the Marist College Institute for Data Center Professional program, is a data center power and cooling expert, is widely published,speaks at many industry seminars and is a corresponding member of ASHRAE TC9.9 which publishes a wide range of industry guidelines. In my humble opinions----Not sure that it is automatically correct to assume that all CBs are only rated for 80% of rated amps continuously. MCCBs over say 250 amps not always the case. 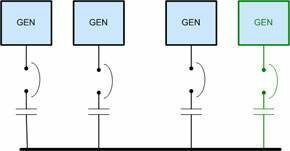 For medium voltage CB of most all types are typically rated at 100% continuous.